In January 2017, Ezra Brooks launched this new whiskey into it's product lineup. Ezra Brooks Straight Rye is distilled in Indiana at MGP with a mashbill containing 95% rye and 5% barley. It's parent company, Luxco, recently went all in on refining the appearance of Ezra Brooks whiskey in an effort to push a premium brand ideology. For what it's worth, the matte-finish label is a really, really nice touch! Nose: Light and crisp. Red apples, pound cake, and caramel conjure a semi sweet aroma. Heavy dough notes, as if you've stepped into a bakery and smell all the rising bread. Underneath this lays a gentle spice. Taste: Silky smooth with a thin layer of rye spice and cinnamon. It’s a very soft and clean whiskey on the palate, with apples, bread, vanilla, and caramel. Finish: Short with a sweetened, gentle spice. Conclusion: Ezra Brooks Rye is a soft whiskey with an intriguing amount of complexity; it's only 2 years old, yet I’m surprised by the array of flavor, albeit subtle. Compared to the Ezra Brooks 7 year, 101 proof bourbon for $16 (which in my opinion, is the very best bang-for-your-buck bourbon available), this doesn't quite compete. This is a perfect "drink it neat at the end of the night whiskey", after you've exhausted your taste buds with other high end or barrel proof bourbon. It is unclear whether Jim Beam believes we are in the midst of a bourbon shortage. They claim they are not, however actions have always spoken louder than words. What is clear, unfortunately, is Beam’s premium whiskeys aren’t as flavorful as they once were. Jim Beam (along with many other distilleries) has removed age guarantees on a variety of mid to premium brands. Basil Hayden’s, for example, was once labeled as "Aged 8 Years", and then the age statement was replaced by "Artfully Aged". In addition to these ambiguous buzzwords being slapped onto Beam’s bottles today, there also seems to be a noticeable decay in the taste of non age statement whiskey. 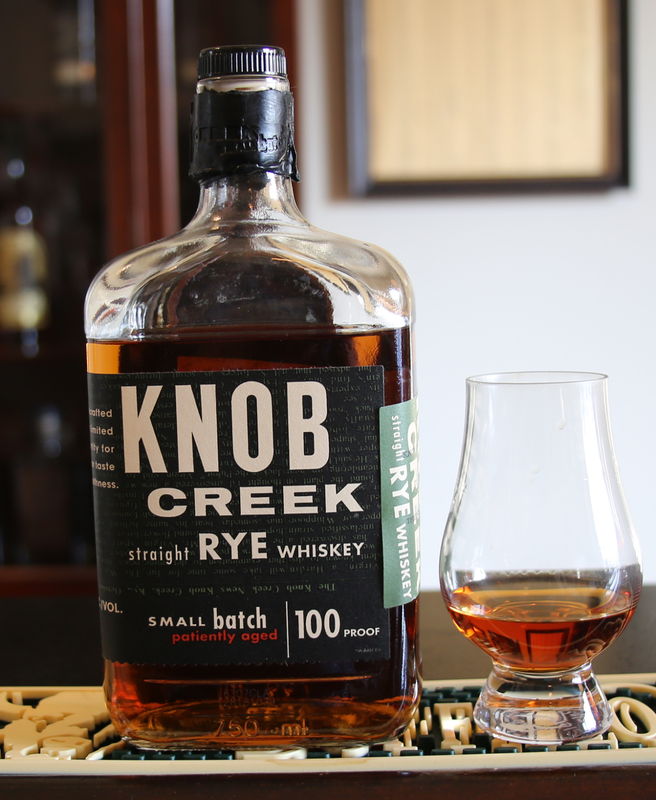 The recent release of Knob Creek rye is a perfect example of a no age statement, (rest assured, "patiently aged”) whiskey that simply isn’t as good as it used to be. Nose: Light sweetness with vanilla, caramel, and sweet corn. The aroma is fairly herbal with a shallow reminisce of rye spice. Taste: A chocolaty sweetness with herbal undertones. Characteristic Jim Beam yeast flavors stamp an impression onto the palate. Rye notes peak on the back end with a sharp, pepper spice. Finish: Short with a dry, light spice. Conclusion: This recent batch of Knob Creek rye falls short of expectations. A few years ago it was a delicious whiskey with a complex, bold, and spicy profile. These days it’s just decent, tasting light and unapologetic. This decline in age and quality will leave a blemish on Jim Beam as long as their prices continue to remain the same. I didn’t mean to go on a long tangent about quality control (maybe subconsciously), but this evolutionary decay really grinds my gears.